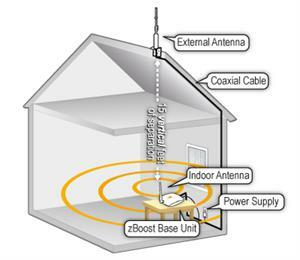 zBoost, a leader in consumer cell phone signal boosters, offers the improved zBoost ZB545M SOHO as the solution to your missed and dropped calls inside your small office or home office area. The innovative zBoost SOHO Max signal booster boosts voice coverage on 3G phones for all North American carriers operating on CEL 800 MHz and PCS 1900 MHz frequencies. The zBoost SOHO Max ZB545M signal amplifier captures the reliable cellular signal you have outdoors and rebroadcasts it indoors, up to 3,500 square feet, so you can enjoy clearer, faster and more reliable service without interruption. zBoost ZB545M signal amplifier for Large Home or Office. 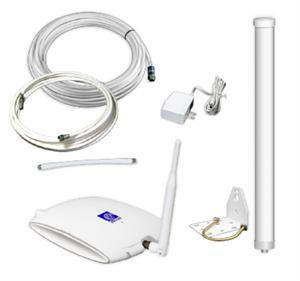 Everything you need is included: amplifier base unit, indoor antenna, power supply, 2 RG6 cables, external antenna, and mounting hardware.